because i'm not in the mood these past weeks to post some Gundam stuff. Anyway i'm here again to make some blog posts. 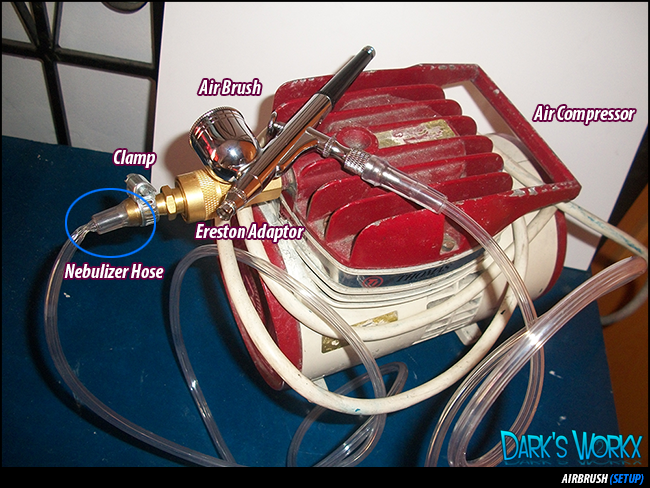 Today i'm going to share my Airbrush set on a tight budget. The price of this one is really cheap than the others and i recommend this one for starters. You may ask Vanz for the Badger and this airbrush comparison. Second is my Air Brush Compressor, Thomas. I bought this 2nd hand compressor at a very low price than those P4,000.00 PRO/Branded Compressors. Thanks to the owner fil for selling this one to me. This one can be fitted to Badger Airbrush Hose, etc just like he said. I bought this P30~40.00+ Hose from Watson Drug Store. This one cannot be fitted to original Thomas Adaptor. This one cannot be fitted also to the hose and original thomas adaptor, so my father helped me push the hose into this adaptor using heat and add tightness using clamp. I used these clamps for additional tightness and to be able to stop the air going out.